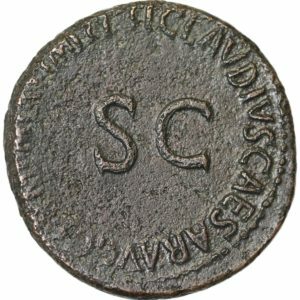 Sestertius dated 22-23 AD, struck under Emperor Tiberius in Rome. 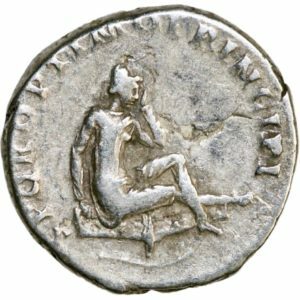 The coin was a commemorative piece for Emperor Tiberius’ mother, Livia, who died in 23 AD in Caprea. Livia had come into conflict with the emperor, and had therefore escaped to Caprea three years earlier. Rev. 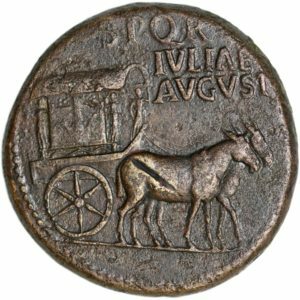 : Carpentum (chariot) pulled by two mules. Grading: VF. 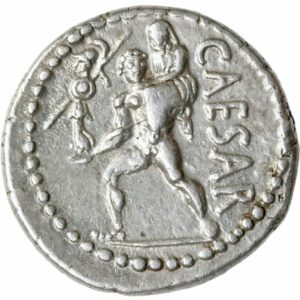 Reference: Sear (2000) 1738, RIC Tiberius 51. 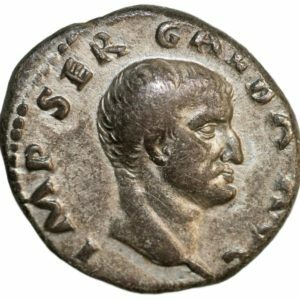 Weight: 26,82 g.
As dated 50-54 AD, struck under Emperor Germanicus (brother of Claudius I) in Rome. Grading: F. Rev. : Large «SC». Reference: RIC 106 (Claudius). 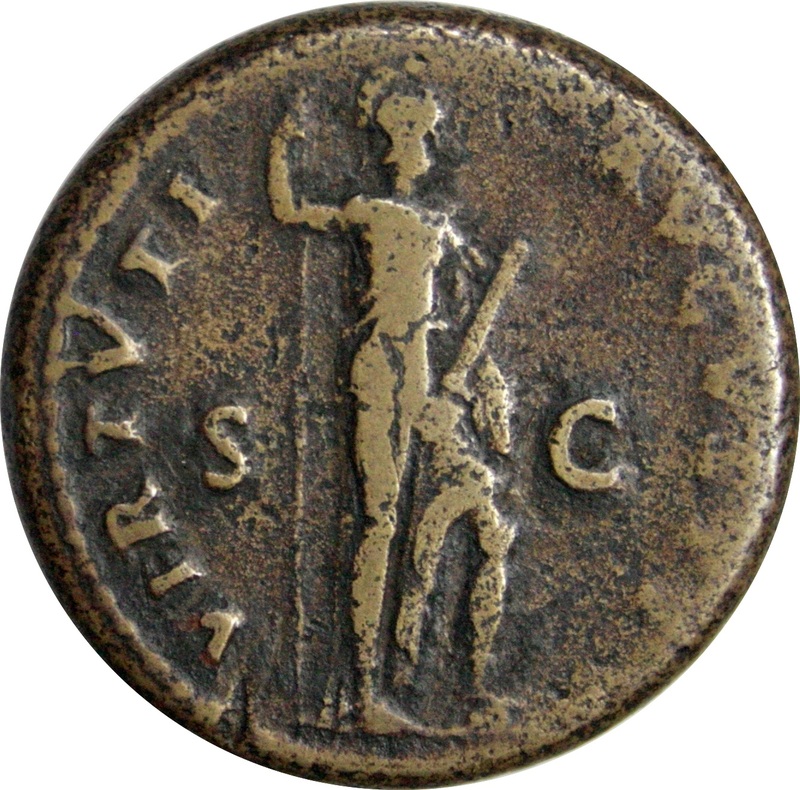 Provenance: Roma Numismatics Ltd. 27:440. 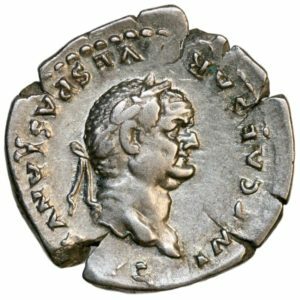 Weight: 12,28 g.
Denarius dated 68-69 AD, struck under Emperor Galba. Grading: VF. Reference: RIC 167, C. 287 corr., BMC 34 corr. Weight: 3,21 g.
Denarius dated 103-107 AD, struck under Emperor Trajan in Rome. Grading: VF. Rev. : Dacia seated right on shield in mournful attitude. Reference: RIC 219, BMC 176. 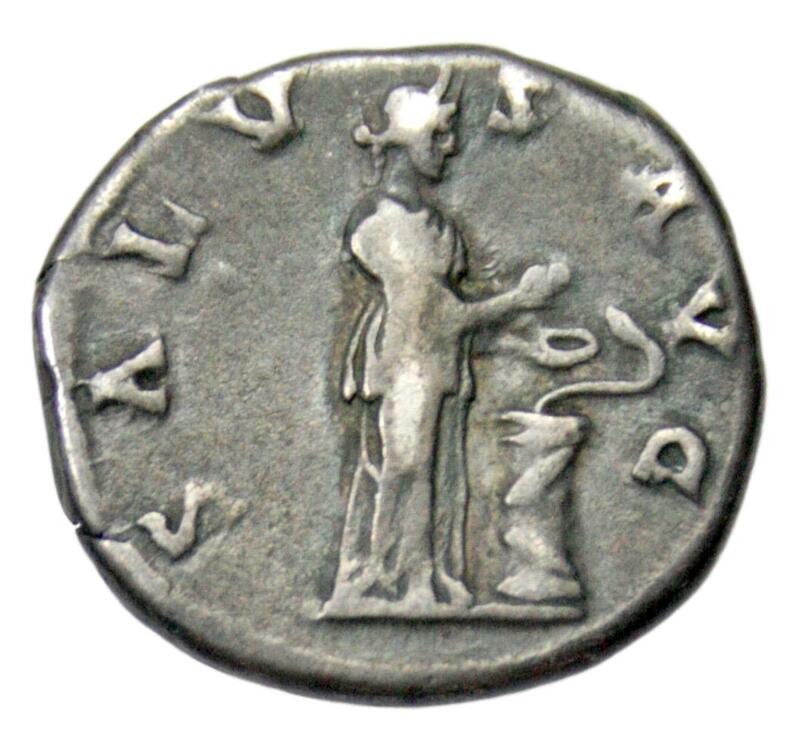 Weight: 3,21 g.
Denarius dated 91 AD, struck under Emperor Domitianus in Rome. Rev. : Minerva. Grading: F/VF. References: RIC 727, C. 267, BMC 186. Weight: 3,16 g.
Denarius dated 76 AD, struck under Emperor Vespasianus in Rome. Grading: VF)(XF. Rev. : Jupiter. Reference: RIC 849, C. 222 og BMC 276. 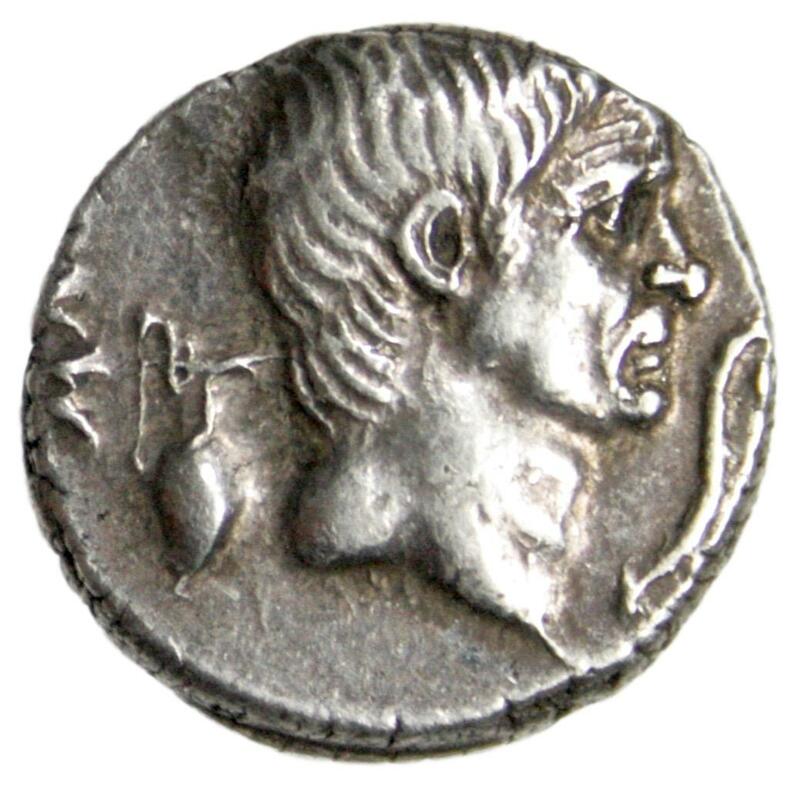 Weight: 3,28 g.
Denarius dated 47-46 BC, struck under Julius Cæsar in a North African mint. Rev. : Aenas carrying Palladium and his father Anchises. Grading: VF. 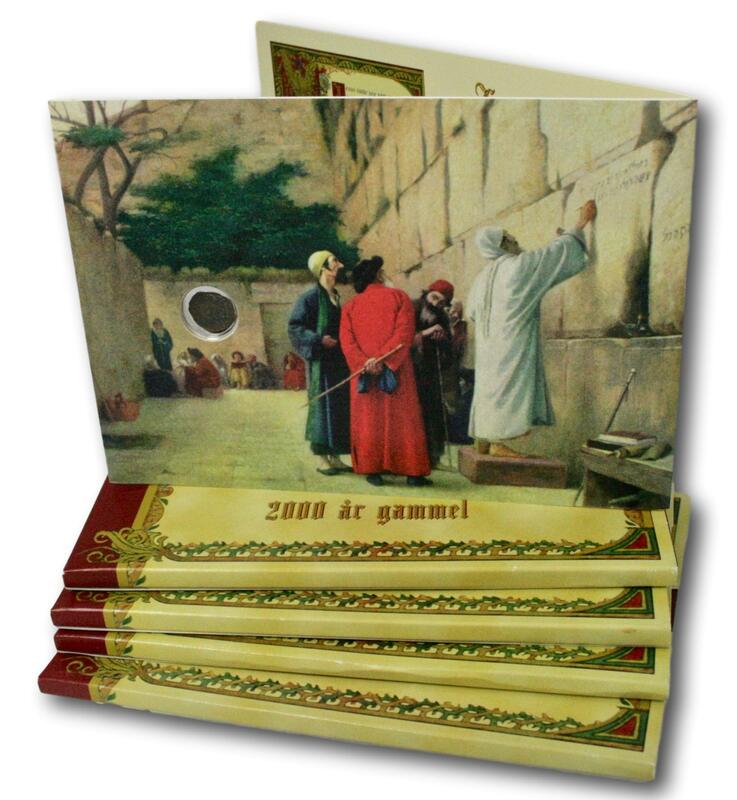 Reference: Sear (2000) 1402. 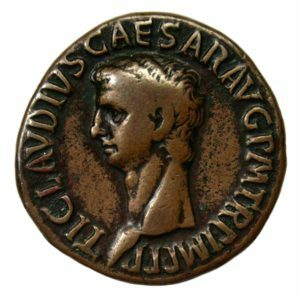 Weight: 3,98 g.
As dated 42 AD, struck under Emperor Claudius in Rome. Rev. : Libertas holding pileus. Grading: VF (beautiful style and patina). Reference: Sear (2000) 1860. Weight: 11,21 g.
Denarius dated 42-40 BC, struck under Sextus Pompeius Magnus Pius in Sicily. Rev. : Neptun flanked by the brothers Anapias and Amphinomus. Grading: VF/XF. Reference: Cr. 511/3a. Provenance: Emporium Hamburg 77:362. Weight: 3,9 g.
Denarius dated 137 AD, struck under Emperor Hadrian in Rome. Grading: VF. Rev. : Salus feeding snake. Reference: Sear (2002) 3540. 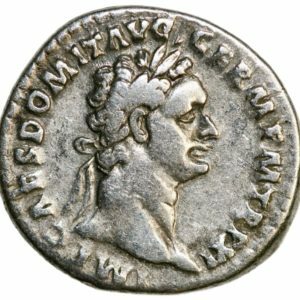 Weight: 3,1 g.
As dated 92-94 AD, struck under Emperor Domitian in Rome. Grading: F. Rev. : Virtus. Reference: Sear (2000) 2798. Weight: 14,59 g.